Tonight we have something a little different – a picture of Austerity 8F no. 90151 doing what it did best – hauling a heavy goods train. The class were designed by Robert Riddles (based on Stanier’s 8F class) whilst he held the position of Deputy Director of Royal Engineering Equipment during the Second World War. Riddles of course would go on to become Chief Mechanical Engineer of British Railways. 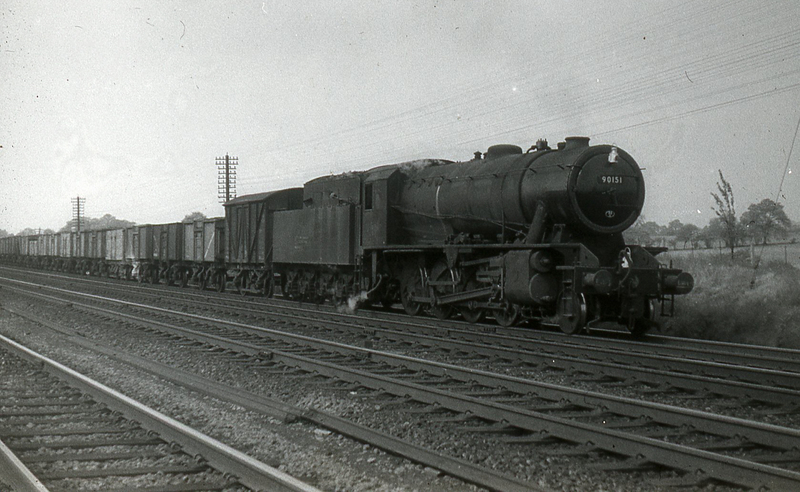 935 Austerity 8F 2-8-0s were built. British Railways took on 733 members of the class from the Ministry of Supply in 1948, the last of which (90732) would carry the name Vulcan, after the works after the Works at Newton-le-Willows which was situated in the village of Vulcan in the parish of Newton. The Vulcan works was heavily involved in the design and development of the type, as well as building many. None of these 733 locomotives, including 90151 survived into preservation. 90151 was disposed of in 1963 at Doncaster Works. However, one 8F Austerity lives on in preservation at the Keighley and Worth Valley Railway. A product of Vulcan Works, this survivor never ran on British Railways but was operated by Nederlandse Spoorwegen (NS, Dutch Railways). WD No. 79257 has been numbered 90733 as if it was the next British Railways loco, after 90732 Vulcan. ← A Mucky Duck perhaps, but an Ugly Duck? 90732 was named Vulcan after the Works at Newton-le-Willows which was situated in the village of Vulcan in the parish of Newton. The site of the works is now being redeveloped into a huge housing estate.